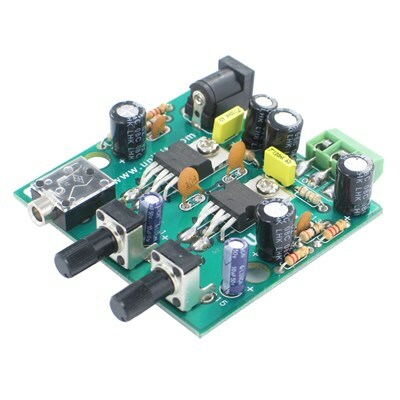 A compact 10W (5W + 5W) stereo amplifier based on two TDA2003 Integrated Circuits. Its very compact dimensions and low harmonic and cross-over distortion make it ideal for all kinds of audio amplification applications, especially for kiosk or similiar application where a small amplifier is required. It is also well suited for connection to your iPhone, iPod or any other portable MP3 player to allow these devices to be connected to standard speakers. Completely safe operation is guaranteed due to protection against DC and AC short circuits, thermal over-range, load dump voltage surge up to 40V and fortuitous open ground. It comes with a 3.5mm stereo audio input jack as well as screw-on terminals for speaker outputs for easy wiring. A custom case with silk-screened panels is also available under CanaKit part # BX560.